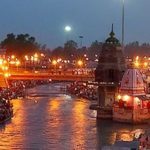 Chardham Weather Info - stay up to date with the information of chardham yatra 2018 from top chardham agent in Haridwar. Chardham are the names of four pilgrimage places in Uttarakhand, India that are widely revered by most Hindus: Badrinath, Dwarka, Puri and Rameswaram.The Chardham defined by Adi Shankaracharya consists of three Vaishnavite, one Shaivite, and one mixed site Over the years, the term “Chardham Yatra”has lent itself to the all-denomination Chardham pilgrimages in the Garhwal Himalayas in Uttarakhand, where Adi Shankaracharya attained freedom from embodiment. 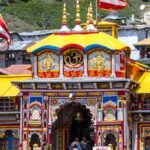 Earlier known as Chota Chardham or ‘Little’ Chardham to differentiate them from the bigger circuit of Chardham route, after the mid-20th century they themselves started being called the Chardham. 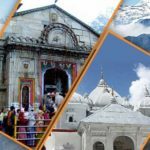 Today, the term “Chardham” usually refers to the all – denomination Himalayan Chardham. The Chardham are often considered the most revered sites for Hindus that have to be visited in one’s lifetime. Summer: Summers starts from April and ends in July. 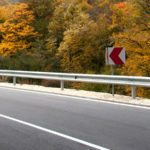 Temperature during this season ranges from 6 to 20°C. 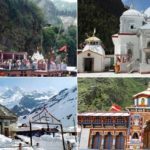 Winter: October to March marks winter season in Yamunotri. In this season, the place also experiences snowfall as temperatures falls below 0 degree. Winters are chilly with the temperature ranging from -7 to 5°C. Summer : Gangotri witness its summer season from the month of April which ends in the month of May. Generally the summer season of this place is quite pleasing as it is observed that the temperature even in the summers never crosses 30Â°Celcius. But mostly the nights get very cold. It is one of the best seasons in the Gangotri for pilgrimage and sightseeing trips. Monsoon : This place welcomes its monsoon from the late July â€” August month. This season is accompanied by very heavy rainfall. This season is also considered as bad time to visit the temple due to heavy rainfall. Winter : Winter season in the region starts from the month of November to March. Usually in winters, the season is freezing cold and having a heavy snowfall which can even interrupt your journey. So most people avoid visiting Gangotri in winter season. Summers : (May to August) are pleasant as the average temperature remains around 17℃. This is considered as the best month for visit. The climate is so good that one can be comfortable to visit temples and near by attractions..
Monsoons: (September to October) are offering good rains but the weather becomes chilly as the temperature becomes low. Winters: (November to April) are freezing cool as the minimum temperature goes down to 0℃. Usually people prefer to keep off visiting during this season. January: Very Cold with Snowfall. Temperature varies from – 4 to 7℃. January has a freezing climate with snowfall. The snow clad nature is imposing and ideal for winter sports. February: Very Cold with Snowfall.Temperature varies from 0 to 10℃. February is snow bound with nature appears with eye catching white cover. Good for winter travels. March: Cold Temperature varies from 4 to 14℃. March offers reprieve for the freezing cold. The atmosphere starts to become warm. April: Moderately Cold Temperature varies from 7 to 17℃. April is cold but perfect for all tourist activities. Day times are bit warm, but nights are cool. May: Moderately Cold Temperature varies from 7 to 18℃. May is moderately hot with sun appears over the sky most of the days. Good for outdoor travels. June: Pleasant Temperature varies from 10 to 20℃. June is the hottest month of the year. The atmosphere is temperate. The nature looks attractive and suitable for tourist activities. July: Pleasant Temperature varies from 7 to 18℃. July has beautiful showers in its kitty. The nature dresses in new lush green new leaves. Good for enjoying the picturesque nature. August: Moderately Cold Temperature varies from 7 to 15℃. August is pretty good with picturesque nature and flowering plants and trees. August offers moderately warm climate. September: Moderately Cold Temperature varies from 7 to 15℃. September is humid with post monsoon showers. The nature appears fresh. October: Cold Temperature varies from 5 to 14℃. October welcomes winters with all its majesty. The climate is moderately cold. November: Cold Temperature varies from 4 to 14℃. November offers a very cold ambiance. This month is ideal for honeymoon travels. December: Very Cold Temperature varies from 2 to 10℃. December is very cold. Outdoor activities require winter dresses and often snowfall is seen.